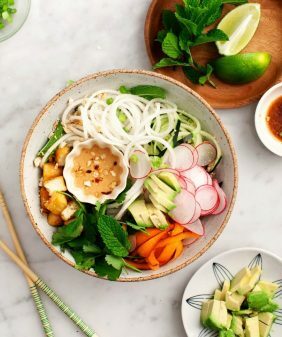 An easy vegan weeknight recipe made with ginger-lime marinated kohlrabi, fresh herbs, and rice noodles. A great make-ahead lunch! Healthy & gluten-free. Oh, kohlrabi… I first learned of this alien vegetable years ago when I received my very first CSA box. At the time, I wasn’t adventurous with vegetables, so I had no clue what it was and no clue what to do with it. 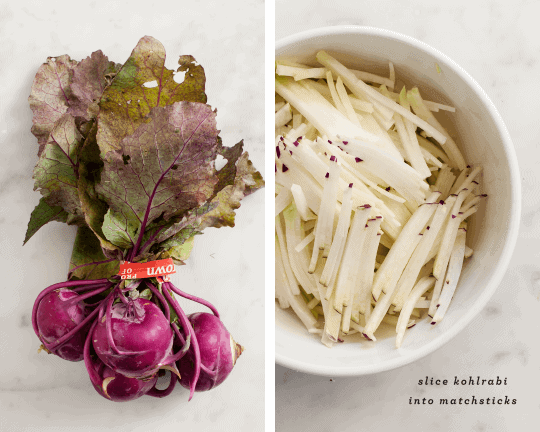 Kohlrabi has seemed to gain some popularity since then – I often see it on restaurant menus – but back then it was barely google-able. Fast forward to now – it’s one of my favorites. People say it’s similar to broccoli stems, but I think it’s closer to daikon or even jicama. Slice it up into sticks, marinate it a bit, and it makes a great crunchy slaw. I’ve put this exact slaw on tacos, but today I’ve mixed the white kohlrabi sticks with rice noodles. Slice your kohlrabi so that it’s a similar shape to the rice sticks. 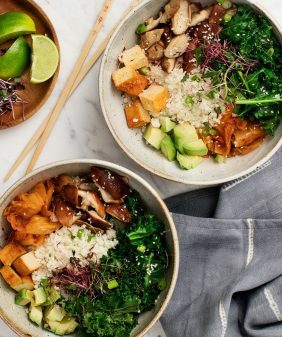 You’ll feel like you’re eating a huge bowl of noodles, when, in fact, half of your bowl is all veggie. If you can’t find kohlrabi, you could do a similar thing with cucumbers. I used these noodles, but you could also use these. i have seen this vegetable around but never tried it. you made such a delicious looking salad..
A few years ago I was at the farmer’s market and the man asked me if I had ever tried Kohlrabi and when i said no, he gave me two of them for free and promised that I would be back for more. He was right! I agree, they remind me more of jicama than broccoli. 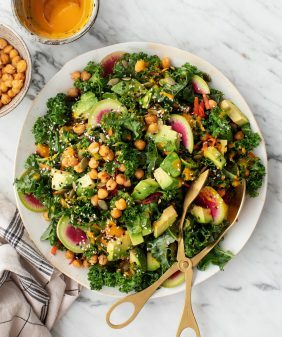 This salad looks so fresh and light, I love it! 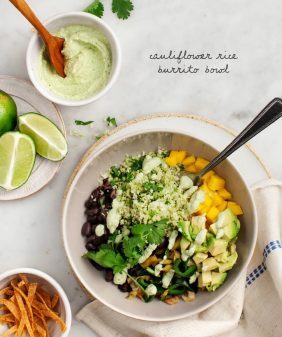 Love kohlrabi, avocado, and peanut pairing with rice noodles. Such a yummy combo. I think kohlrabi tastes like jicama too. In fact, I use it in place of jicama since we can’t get it here in Switzerland. I’ve only used kohlrabi few times but should really challenge myself to use it more. Love it in a slaw but I think it would be nice roasted too. Great idea to pair it with noodles and some heat. Lovely! I like how you added rice noodles on top. This dish is so wonderfully fresh and colorful. Now you’ve peaked my interest to try kohlrabi, as well! I’ve never even heard of this before but after seeing your photos and reading the post, I need to try this! Sounds really amazing. Thanks! Mmm this look so good. I love noodle dishes. The first time I had Kohlrabi was also when I received it in my CSA box. Back then I also had no idea what to do with it and ended up using it in a slaw. I would have never thought to add noodles! Can’t wait to give this a try. Oh my gosh these look just amazing. I absolutely adore kohlrabi!! I usually make mine in a slaw, but I cannot wait to try it this way. Great recipe, as always. 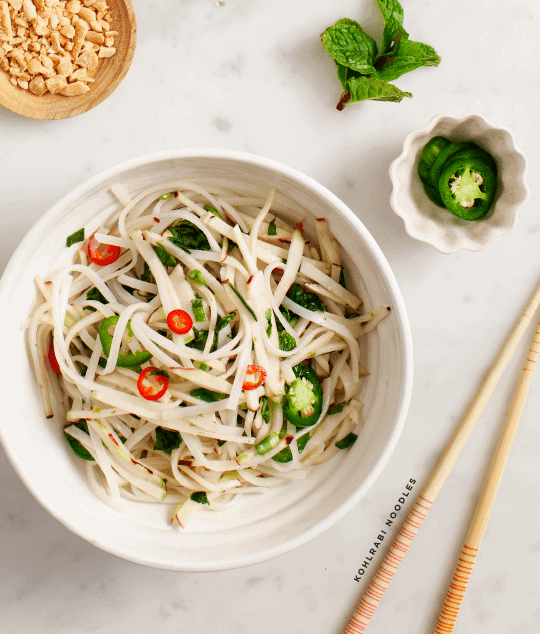 I love eating kohlrabi slaw and this recipe is absolutely lovely. We had really sweet Eastern European neighbours at one time that grew kohl rabi in the warm months and always brought some over for us when we were little. My mum did a crummy job of selling us on it by saying, “It’s sorta like turnip!” But once I started working in restaurants, I started getting into it. The fresh daikon-ish/mild radish qualities of it, as you noted, are so lovely in spring time. Loving this noodle mix up strategy. I have never eaten/heard of this! I love the way you incorporate unknown/unusual vegetables into a delicious meal, helping us uneducated veggie eaters! If I ever come across it I will buy it and make! I haven’t tried kohlrabi yet but will surely do. Thanks for this! 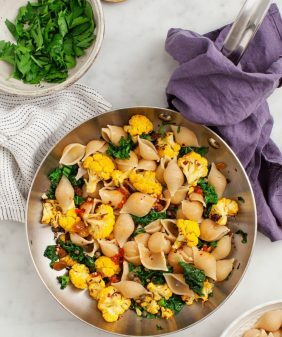 Nice try with Kohlrabi.This looks awesome and delicious.I’ll make a try. This was simply amazing… I was so happy to try a new veggie… I found green kholrabi and your right reminded me of broccoli stems. This whole recipe was just so delicious and fresh. Perfect for warming weather. Thank you! 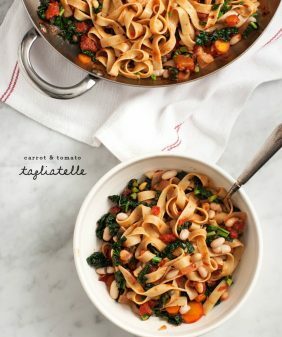 Totally making this with my three lonely CSA kohlrabi!! Love the flavors here…can’t wait to try it!! I’m not much of a cook but this recipe turned out great. It is perfect for a summer dinner when you really want something fresh. I’m so glad you liked it, thanks for sharing!